The new season of Bravo's Top Chef starts Wednesday, August 19th, and this season it has some local flavor! Not one, but two local chefs will be competing on the popular chef competition show on Bravo. Robin Leventhal and Ashley Merriman will both be representing Seattle when the new season premieres. Robin Leventhal is the former owner of Crave, a popular Seattle Bistro. She is currently helping to raise money for Lymphoma research and is closely involved with the Fred Hutchinson Cancer Research Center in Seattle. I have had the privilege to have eaten at Crave a few times before it closed down, and Robin was our server. Crave used to be located on 12 Avenue on Capitol Hill. The food was amazing and the little bistro was always packed full of customers. I also had the privilege to attend one of Robin's Copper Cure Charity Auctions last year to help raise money for cancer research. The auction included copper molds, gift baskets, and private chef dinners. Above are some pictures I took from last year's event. The other local chef on the show is Ashley Merriman. Ashley is the current chef at Branzino in Seattle. The restaurant is located in Belltown on 2nd Ave. She also used to work at Tilth. Unfortunately I have not visited Brazino yet, but I definitely want to check it out. I'm sure they will be busy with the exposure the restaurant will receive with their star chef being a contestant on Top Chef. Ashely has been recognized as one of the Seattle culinary scene's brightest new talents. 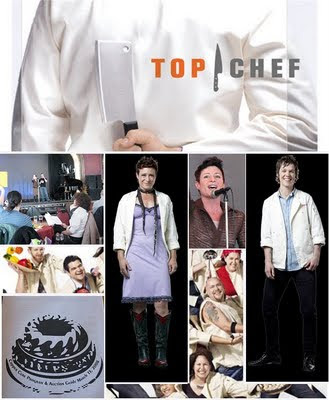 I'm a foodie, food blogger (Chow Down Seattle Food Blog) and a huge fan of Top Chef. I'm really excited to have two very talented and creative Seattle chefs on one of Bravo's most popular reality-competion shows. I will be watching every episode each week, and I hope both Seattle chefs make it to the finals! I wish both Robin and Ashley the best of luck on the show! Top Chef: Las Vegas will air on Bravo! TV Network starting on Wednesday, August 19th at 9:00pm PST. Hi. Just browsing other fellow Seattle food bloggers & hoping to add them. Cool blog, by the way. Feel free to stop by my Seattle-based food blog at www.nmos-omnomnomnom.blogspot.com. Thanks!